Yes. Camp Matoaka is an accredited member of the American Camp Association. Both Jason and Leslie are active members of the ACA. Jason serves as the Vice President of the ACA. Where do most Matoaka campers come from? Our campers come to us from more than 20 states and five different countries. 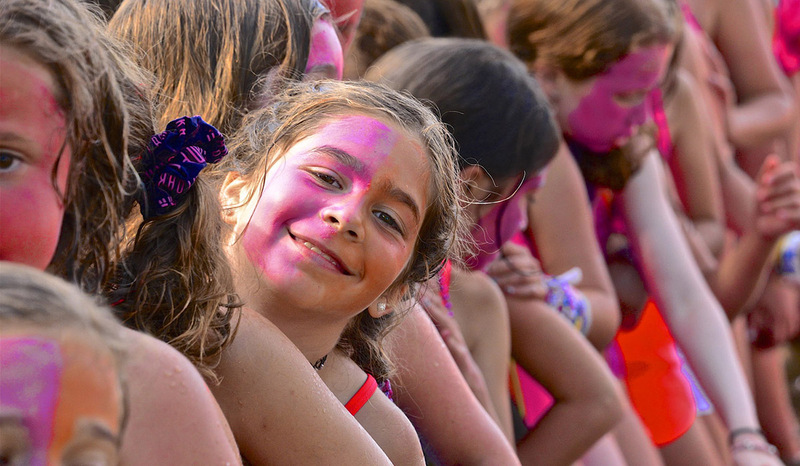 We try our best to ensure campers have an opportunity to meet as many girls from other areas as possible. Certain geographic areas are more represented than others since most of our campers hear about Matoaka from friendships with current families and alumnae. Our largest groups of campers come from the Greater Boston area, South Florida and the Tri-state area (New York, New Jersey, and Connecticut). We also have a large number of girls from Maryland, Pennsylvania, Illinois, Georgia, and California. How long is the staff training? Since all of our staff are college-age and older, Camp Matoaka is able to hold an extensive pre-camp training. This ten-day training helps counselors to learn everything from our daily schedule to dealing with homesickness. We are fortunate to have many returning staff who are able to help new staff adjust to camp during these ten days. We also incorporate myriad speakers into our training sessions, including Scott Arizala, Randy Judkins, True to Life Training, Jonathan Epstein, concussion specialists, etc. They are experts in child development, safety and responsibility, team building, and fun! What about children with special dietary or medical needs? Camp Matoaka partners with a Food Allergy Coach, who has a nutrition and dietary-background, to help manage and oversee all of the campers with food allergies and restrictions. She works closely with Leslie and the Health Center team to be sure all campers are making safe choices throughout their time at camp. Our team ensures that there is always something for these campers to eat, whether it’s on a day-trip off-camp, at Milk and Cookie time, or during a special event, such as our July 4th Carnival. With our Health Center team of 5 nurses, in addition to our Camp Psychologist and Food Allergy Coach, campers who have specific medical needs are in excellent hands. Is the camp oriented toward competition or individual skill development? Camp Matoaka emphasizes participation and individual achievement over competition. Any camper who wishes to be part of our inter-camp teams (gym, soccer, swim, etc.) makes the team. Every camper who auditions for the play is cast; and all campers are invited to participate in the talent show, dance show or music recital. What kind of health care system does the camp offer? Five Registered Nurses and one local Nurse Practitioner oversee our Health Center throughout the summer. Our Nurse Practitioner, associated with Camp Matoaka for over 15 summers, visits camp each day, and all nurses live on campus and are available 24 hours a day, and the nearest hospital is 9 miles from camp. Matoaka’s Health Center Manager has been a part of the camp family for 10 summers. Our wellness team also includes our Camp Psychologist and Food Allergy Coach. Camp Matoaka’s Health Center provides first aid and administers all over-the-counter medications. The nurses also administer scheduled medications to campers. Our facilities enable us to perform strep screening, blood glucose monitoring, urinalysis and much more! All waterfront staff are Lifeguard and First Aid/CPR certified, and all camp staff are trained in first aid, concussion awareness, and other emergency procedures throughout Staff Training. Our campers have five scheduled, instructional classes and two electives each day. Click HERE to view a typical day. Is Matoaka on a lake or do they travel off campus to a separate facility? Camp Matoaka is located on East Lake, and our campus has over one mile of waterfront property. Does Matoaka require a uniform? There is a minimal camp uniform that must be purchased from our official clothing outfitter. A suggested equipment list is provided for your convenience. How many campers sleep in a bunk, and what is the camper to counselor ratio? Our bunks range in size from ten to twenty campers, depending on the age of the camper, the physical size of the bunk, etc. Most cabins have four or five counselors and our overall camper-to-counselor ratio is 3:1. In addition to the cabin counselors, a Unit Head oversees each age group and ensures community and communication among the campers and staff.